Exclusive holidays: Soma Bay is another of the up-and-coming all inclusive holiday resorts you’ll find dotted along the Red Sea. Surrounded by sea on three sides, it’s in a truly special location. The golden beaches here are amazingly flat, and offer spectacular views of the sea and the cloudless bright blue sky. The exclusivity of Soma Bat holidays is highlighted by the fact it can only be accessed by a private road controlled by a secure electronic gate. That means that inside the peninsula of Soma Bay, everything is geared towards great holidays. Top golf: The golf course in Soma Bay, The Cascades, comes with a number of accolades, with the Golf Journal voting it the best course outside Europe for three years in a row. This spectacular course has endless views of the Red Sea, as well as holes which are right by the coast, just like the famous Pebble Beach golf course in the USA. House Reef diving: Soma Bay holidays have an excellent reputation for diving. 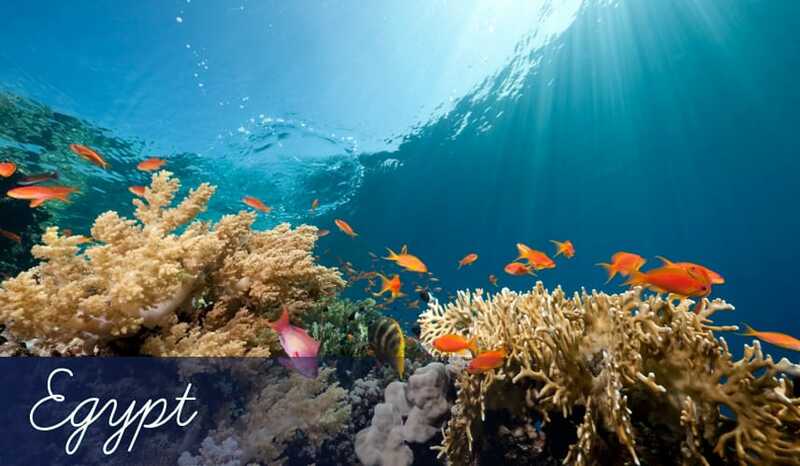 Indeed, there’s a whole host of dive sites in Soma Bay, grouped under the name of ‘House Reef’. Tubya Arbaa, Ras Umm Hesiwa and Shaab Saiman are all fantastic dives that you simply must experience on holidays to Soma Bay. The assortment of fish spotted here includes lion fish, puffer fish and barracudas. Kite surfing: Soma Bay is considered to be one of the best places in the world for kite surfing holidays. The mountains which form the backdrop of Soma Bay help to accelerate the winds, whilst the water remains flat and still – both ideal conditions for kite surfing. The kite surf school in Soma Bay also offers lessons and equipment for beginners and experts alike. Cascades Golf Couse: This championship level golf course, part of The Cascades Hotel in Soma Bay, often wins many awards for its quality. Some holes actually follow the coastline, adding an extra dimension to your shots. The course has been thoughtfully designed too, combining arid desert sand with lush green grass. And if you feel you need to brush up on your golf skills first, there’s full tuition available by PGA professionals. With a course as amazing as this, many people come to Soma Bay purely for golfing holidays. Cascades Spa: In a similar way to the golf course, this spa is actually part of The Cascades Hotel, but it’s available for everyone having holidays in Soma Bay. It’s an incredibly beautiful spa with the key centrepiece being a huge aqua tonic seawater pool. It also features massage rooms, jet showers and facial beauty treatments. Golden private beaches: Soma Bay has some of the best beaches on the whole of the Red Sea. It’s partly because of the resort’s unique location, with sea on three sides. The intensely blue (but crystal clear underwater) sea and incredibly flat golden sand makes for beautiful beaches, with many of them privately owned by the all inclusive hotels in Soma Bay. Hotel bars: Soma Bay is purpose built for all inclusive holidays, so it doesn’t really have any independent bars or restaurants of its own. The hotels in Soma Bay have more than enough in the way of evening entertainment and luxurious drinking spots. The main hotels, La Residence des Cascades, Sheraton Soma Bay and Robinson Club all have excellent bars serving a variety of cocktails, branded beers and spirits.